Francesco is a student based in Birmingham in the UK who is currently doing his placement year at a company called FlashSticks. Flashsticks produces sticky notes which help people to learn new languages and Francesco leads the team's marketing efforts. In his spare time, Francesco runs a YouTube channel where he talks about modern productivity tools and gives people advice on how to get more out of different task management apps in the simplest way he can. When Francesco was younger he read Getting Things Done (GTD) by David Allen and now follows many of the principles in this productivity system. Capturing information and tasks is one of the crucial steps in this system. This involves collecting all the things you need to organise, sort or do some work on in one place. So anything that has an action tied to it, whether it’s a bill, an email, a task or a phone call that needs to be returned should be captured in one place ready for sorting. Francesco uses ToDoist as his main capturing tool where he collects all of his work and tasks in one place. This is a great tool for capturing information as it’s easily accessible across many platforms and integrates well with other apps and services. When new tasks come in to Francesco’s inbox, he’ll write down the specific actions that need to be taken to move the task forward. Being very specific and clear with what actually needs to be done allows you to move forward quickly without wasting time later working out what you need to do with a piece of information. Energy levels e.g. low or high energy. Context. This is the tool he needs to complete the task e.g. his phone, laptop or it could be a book. Time required. So Francesco will estimate how long the task will take to complete. He’ll generally over estimate the time required so he doesn’t get caught out later. 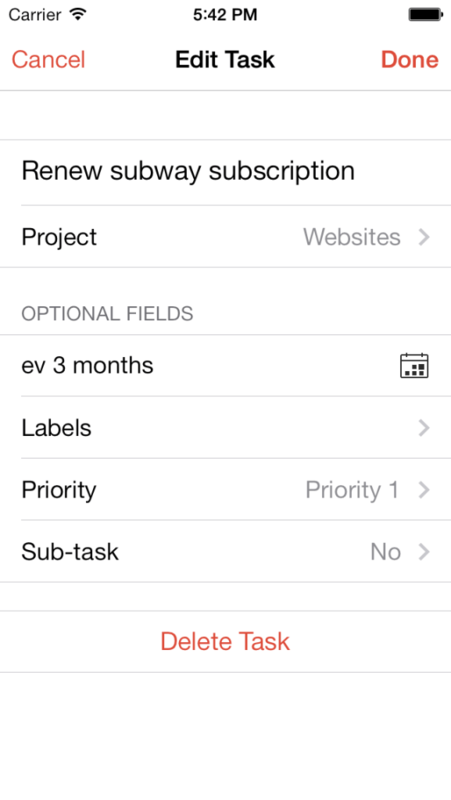 Finally the due date and priority level are added so that tasks can be found via multiple variables. When you have all this information attached to tasks you can find and filter tasks by your context and situation at the time. So if Francesco is on the train, has 10 minutes to spare but only have his phone he can find the tasks that meet these requirements and use the time and resources he has to work on these tasks. Todoist – ToDoist is nice and simple but has the ability to get more powerful as you need it. For example if you were reading GTD and developing your own productivity system at the same you could use ToDoist and apply more of the features as your system grows. The smart input feature is also really useful. You can type things like: “Feed the cat tomorrow at 6” and ToDoist will turn this into a task with a reminder. Swipes – Adding tasks is very quick and easy in Swipes. Swipes will keep everything hidden and organised until you need to address something. So if you have something due at 7pm, it’s hidden outside of the main task management area but will pop up at the right time. This is great for people who get flustered when their task list gets too long. You can easily snooze tasks and changes the reminder times with a few simple swipes. Omnifocus – This app is highly functional and well suited to GTD. You can add a lot of context to your tasks making it well suited for more advanced productivity practitioners. Gneo – Genero is similar to Todoist but is more goal focused. ToDo – Again, this app is well suited to people who follow GTD. The app shows you everything you’re working on in a one page style format so you don’t have to navigate between different projects and screens to see what you’re doing. MeisterTask – This is a brand new app that allows you to organise your workload in a Kanban system. So you can move tasks from a waiting list, to in progress, testing and then done. This is great for anyone who works in teams on different projects. Asana – Asana is well suited for teams and lets you sort projects into different teams. It’s also great to use on your own as you can set up multiple projects and tags to keep everything organised. Any.Do – With a very clean and simple design, processing tasks and bulk editing is very quick and easy using Any.Do. The app also integrates very well with the company's brother app; Cal. So you can plan when you’re going to work on each task. Wunderlist – Wunderlist is another simple and easy to use app that’s built with lots of social features making it very easy to share tasks with colleagues or family members. The design is very playful and is great for entry level task management. Remember that choosing the right tool is less important than following the right principles and techniques for organising your work. Don’t get too hung up on testing every app that comes out. Just pick one that works for you that you like using and stick with it. Firstly, is the app reliable? If it’s going to crash on a regular basis then it’s going to be really frustrating when it comes to managing your tasks. If you’ve also spent a lot of time adding your tasks into an app only to find it’s not very reliable then this could be a big waste of time. Spend a few days testing an app first to see how it performs. Secondly, make sure it works across platforms. Ideally it needs to work on the web, on your phone and comes with a desktop app. It needs to be really easy to add your tasks from anywhere so cross platform optimisation is essential and is very common in most apps. Make sure the app supports offline access. So if you don’t have wifi you want to still be able to get access to your tasks and create new tasks that will get uploaded later. Finally the speed and functionality of the app is important. It needs to have the tools and features that you need to be able to add any context you want to a task. This will be more or less important for some people depending on how much information you want to add to your tasks. 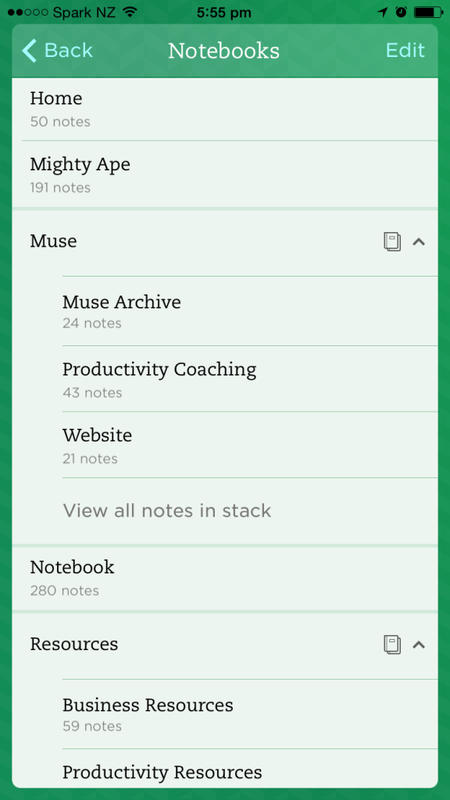 Evernote is a highly versatile note taking app. You can capture information in many different ways; you can use the camera to snap notes, business cards or whiteboards (you can then use the search feature to scan the text on these documents later). You can also save audio notes, create checklists and annotate any of the images in your notes. With all this functionality, getting started with Evernote can be a little daunting. It’s like staring at a blank canvas and trying to work out what to paint. Projects – This holds all the notebooks of the projects you’re going to work on in the next 1 to 2 months. This is generally going to be temporary stuff that you’re working on. Areas – This holds anything that you’re going to tackle in the next 1 to 3 years. Longer term things like notes related to your job could go in here. Resources – This holds all your reference material like blog posts, documents, emails and other templates that you might need to do your work. Archive – Finally this holds your older projects when you don’t need them any more. Don’t delete them as you might want to come back to them, instead just store them in the archive stack. Another great way to get value out of Evernote is to use the webclipper to add content into your notebooks. This browser extension lets you clip blog posts, images and other content from the web into your notebook. This is a great tool for capturing information that we talked about before. You can also go into your Evernote settings and find your custom email address which lets you forward emails straight into your Evernote account (including all of the attachments and images). To learn more about Francesco, head on over to his YouTube channel where he has a tonne of great content to help you get more out of the task management apps that we talked about.